We began acquiring placer property on the Fortymile in 1974. 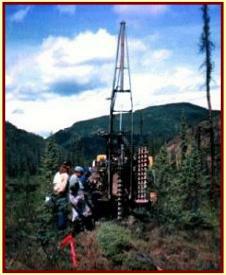 Over the years we have added to our placer holding in the Yukon section of the Fortymile drainage. Today, we control the placer rights to all of the dredgable reserves in the river channel and adjacent banks, a length of 23 miles. Additionally, we hold the terrace gravel along the main stem of the river. We also hold the rights on the most productive tributary creeks on the Canadian portion of the river. Over the years we have developed a network of roads on the property, providing access to various sections of the river and creeks. We have performed evaluation work over much of the ground, including preliminary prospecting work, drilling, excavator trenching, and test sluicing operations by hand and using heavy equipment. We have had a producing dredging operation on the river since 1989. Because of the massive volume of the dredging reserves, our production has depleted these reserves by only a miniscule amount. As well, we have a mining operation that has been producing gold from the terrace gravels of the Fortymile since 1980. Because the Fortymile River valley has great natural beauty, supports a fish population, and is also used as recreational corridor, we have been engaged in numerous research projects aimed at minimizing the footprint of our mining development. We have developed expertise in mitigating the environmental impact of placer mining. Another factor which has influenced our work is the fact that much of the gold which we mine is fine grained. We have incorporated fine gold recovery into our operations. Because much of our placer holding consists of submerged reserves, we experimented with and adopted a dredging method which allowed for the development of these reserves while protecting the aquatic environment. We refer to the gold which we mine as ''green gold''. In 1999 we began fabricating our gold into custom jewellery pieces and opened a goldsmithing studio in Dawson City. This allows our customers to purchase gold jewellery which has not been mined at the expense of the environment. We also sell our jewellery directly over the internet; for more photographs of jewellery pieces we have made and information on ordering jewellery, see the jewellery section of this web site. Evaluating gravel reserves on a terrace adjacent to the river using a 6 inch diameter auger drilling rig. 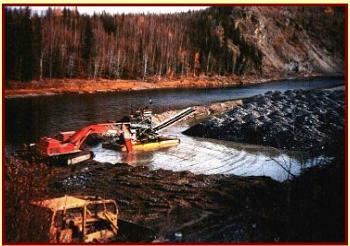 Dredging river gravel on the Fortymile River using an excavator and floating processing plant. 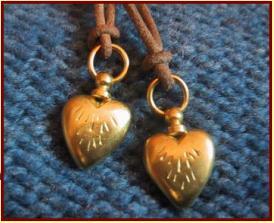 Pendants fabricated from 20K placer gold mined on the Fortymile River.